Quinten Lawrence born September 21, 1984 in Carencro, Louisiana is an American football wide receiver for the Kansas City Chiefs of the National Football League. He was drafted by the Chiefs in the sixth round of the 2009 NFL Draft. He played college football at McNeese State. Pro Career: Second-year wide receiver and return man returns to the Chiefs in 2010 ... Joined Kansas City as the club’s sixth-round (175th overall) pick in the 2009 NFL Draft ... Has seen action in six games on special teams and five games at wide receiver with one start ... Also spent time on Kansas City’s practice squad in 2009 ... Has compiled one reception for nine yards, two rushes for 42 yards and five special teams tackles ... Also has 16 kickoff returns for 317 yards (19.8 avg.). Transactions: Signed with Kansas City (12/22/10) ... Released by Kansas City (12/19/10) ... 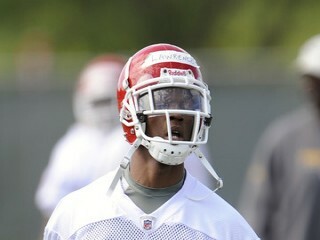 Signed with Kansas City (11/28/09) ... Added to Kansas City’s practice squad (10/26/09) ... Released by Kansas City (10/25/09) ... Signed with Kansas City (7/30/09) ... Drafted by Kansas City in the sixth round (175th overall) of the 2009 NFL Draft. 2009: Played on special teams in six games and on offense in five contests with one start at WR ... Was inactive for five games ... Had one reception for nine yards and two rushes for 42 yards (21.0 avg.) ... Returned 16 kickoffs for 317 yards (19.8 avg.) and recorded five special teams tackles ... Made his NFL debut in the season opener at Baltimore (9/13) ... Returned a career-high six kickoffs for 126 yards vs. Denver (12/6). College: Saw duty as a wide receiver and as a defensive back at McNeese State ... Played in 37 contests (32 starts) for the Cowboys, ranking 10th in school annals with 99 receptions for 1,905 yards (19.4 avg.) and 15 TDs ... Added 22 kickoff returns for 419 yards (18.9 avg.) and took his lone career punt return back 70 yards for a TD ... Recorded one tackle on defense ... Started four games before his senior season was curtailed by a lower leg injury ... Tallied 12 receptions for 209 yards with a TD ... Took back three kickoffs for 61 yards and returned one punt for a 70-yard TD ... Also saw time in the secondary and logged one tackle ... Started all 12 games as a junior in 2007 ... Finished second on the team with 31 receptions for 645 yards and six TDs to earn second-team All-Southland Conference accolades ... Also returned seven kickoffs for 106 yards ... Started all 12 contests his sophomore campaign in 2006 ... Totaled 29 receptions for 479 yards with two TDs ... Also logged five kickoff returns for 85 yards ... Played in nine games (four starts) as a freshman in 2005 ... Caught 27 passes for 572 yards with six TDs and returned seven kickoffs for 167 yards ... Earned first-team All-Southland Conference and team MVP honors ... Majored in General Studies at McNeese State. • An all-district, all-parish and All-Acadiana selection at Carencro High School in Lafayette, Louisiana. • Lettered in football as well as basketball and track. • Was part of the state champion 4x100 meter relay team. • Volunteered with the Chiefs Rookie Club in 2009. • Full name: Quinten Louis Lawrence. View the full website biography of Quinten Lawrence.